FRIDAY, Nov. 2, 2018 -- The hour you "lost" with daylight savings time in the spring you "gain back" on Sunday, when clocks are set an hour back. Still, "for most people, it is easier to stay up an hour later than to go to bed an hour earlier," said Dr. Steven Feinsilver, who directs sleep medicine at Lenox Hill Hospital in New York City. "This is thought to be because for most of us our 'internal clock' is closer to a 25-hour cycle than a 24-hour cycle." He said the furthest you can comfortably shift your internal clock is about an hour a day, and "what sets [your] clock is the wake time more than the bedtime." Feinsilver said that to get back to a normal sleep rhythm, "set the alarm for your target time and get out of bed when it goes off, even if your night sleep was not perfect. 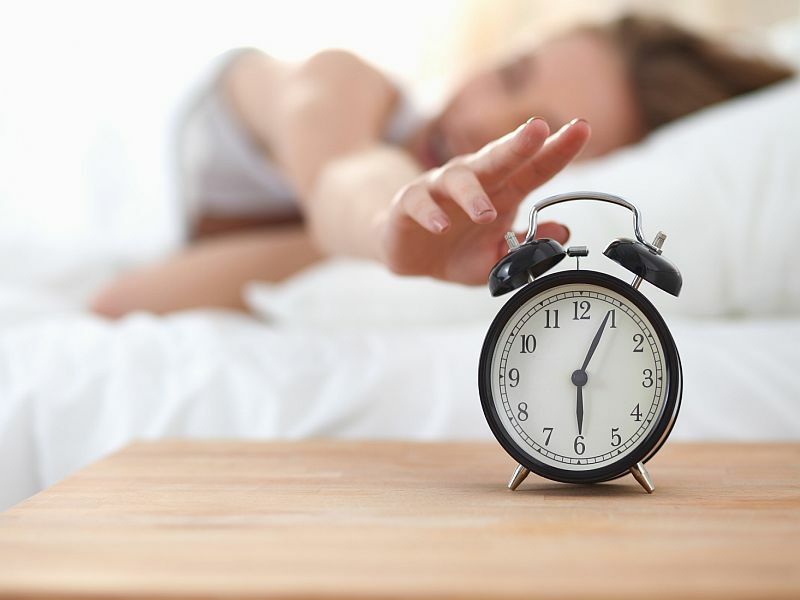 "For the time change, set the alarm for Monday -- for most of us the Sunday morning wake-up is less critical -- and enjoy the extra hour," Feinsilver said. A single night of imperfect sleep is easily gotten over -- "it is when bad sleep becomes a habit we get into trouble," he said. Feinsilver's advice is to try to sleep a regular seven to eight hours -- and "stick to a constant wake time." "Getting exposed to light early in the day wakes us up," Feinsilver said. "This is harder in the winter when there is less and later light, but the autumn time shift helps a bit." Dr. Daniel Barone is a neurologist and sleep medicine expert at the Center for Sleep Medicine at New York-Presbyterian/Weill Cornell Medical Center in New York City. He said that people shouldn't expect that the extra hour of sleep they'll get on Sunday will erase any accumulated "sleep debt." "We as a society sleep one hour less than we did 100 years ago, so we are still 'behind the clock' so to speak when it comes to being sleep-deprived," Barone said. He said the body's sleep clock can be directly affected as autumn days grow shorter and people spend more time indoors. The body manufactures vitamin D via sunlight's action on the skin, and too little vitamin D can affect sleep and emotions. "When you're not getting as much sunlight, it has an effect on your mood," Barone said. For some people, this can even mean the onset of a kind of depression known as seasonal affective disorder (SAD). Switch to LED lightbulbs. They're made to simulate sunlight and can help you maintain a healthy circadian rhythm as seasons change. If you're still having trouble sleeping, consult a sleep specialist for testing, Barone said. "If you're continually waking up in the night or you're constantly waking up tired, a sleep test is definitely warranted," he said. "We should view sleep as something that's sacred," Barone said. "Our bodies are designed to get seven to nine hours. In this 24-hour society, a lot of times the amount of sleep we get suffers. We should focus on getting good-quality sleep and dealing with any problems that exist." There's more on getting good sleep at the National Sleep Foundation.